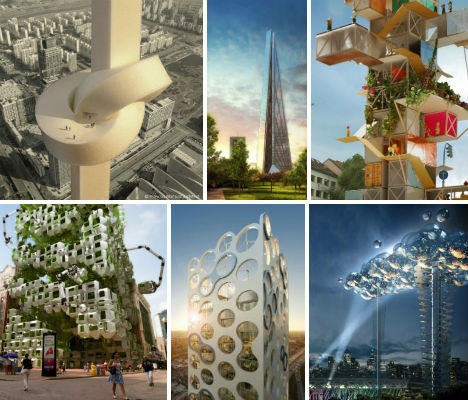 Apartment buildings as thin as blades, towers topped with wind turbines, sky-high viewing platforms that gather energy from visitors’ movements: are these unlikely-seeming designs a glimpse at the skyscrapers of the future, or just fanciful concepts that will remain unrealized? While some are just dreams, others are actually in progress, and a few narrowly missed becoming a reality – because they were just a tad ‘too intense’. By eliminating most of the lower floors of this 36-story residential tower for Singapore, the Office for Metropolitan Architecture (OMA) has created a design that looks almost as if it’s floating. 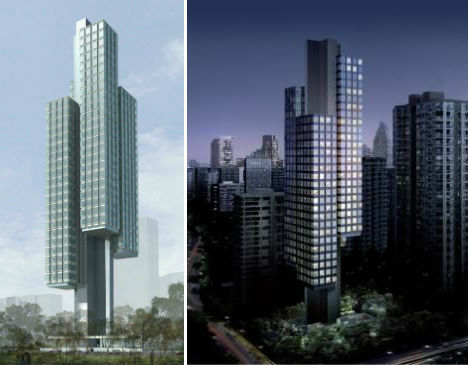 The Scotts Tower was to feature 68 high-end apartment units with panoramic views of the city from its location on Scotts Road. It includes four individual volumes attached to a central core, lifting the living areas above ground level to provide communal leisure activities at the base. OMA’s design has been replaced by a new one from UNStudio. 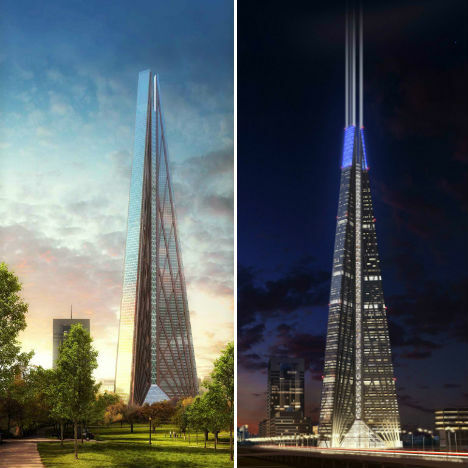 What would otherwise be a fairly standard, if a bit skinny, tower is transformed into something jaw-dropping with the addition of a knot shape near the pinnacle. 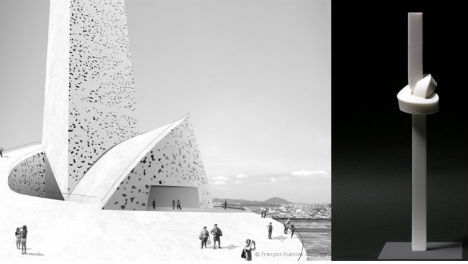 Francois Blanciak Architecture gave the Incheon Tower this unusual feature in order to make the tower seem longer than the maximum height of 450 meters which is regulated by the city of Incheon in South Korea. The space provided by the knot will not only give visitors a panoramic view of the city, but will also feature a large outdoor terrace. 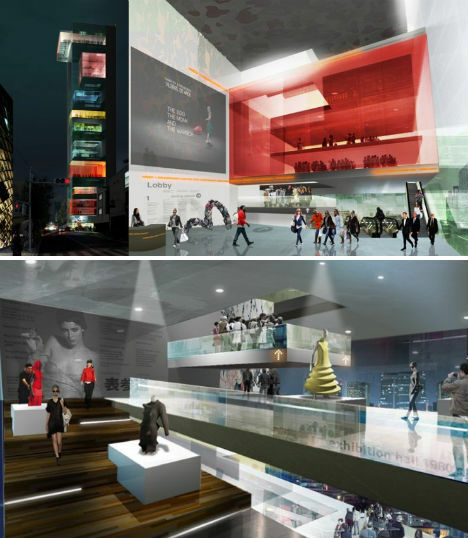 Wai Think Tank’s proposal for the Fashion Museum Competition at Tokyo’s chic Omotesando Street is a 100-meter-high tower with volumes of various sizes and shapes that give the appearance of stacked boxes. Each of these volumes acts as a floating boutique. In addition to museum space and retail shops, the tower includes administrative offices, a runway and a skybox. 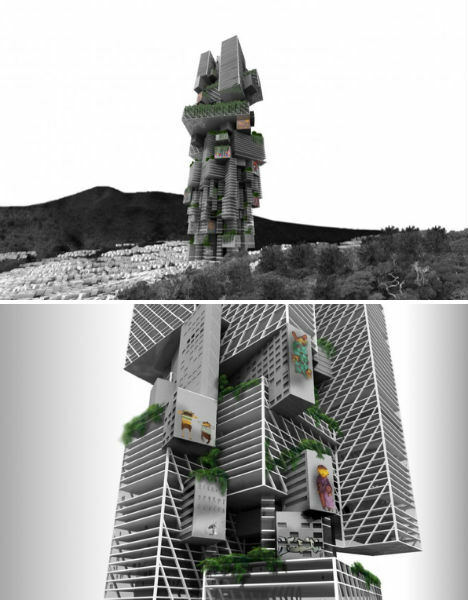 Among the winners of the 2009 eVOLO skyscraper competition, the Convection Slum tower for Rio de Janeiro, Brazil envisions a new, modern home for the residents of one of the nation’s largest slums. The tower addresses the pressing need for inhabitable land, providing not just housing but also integrated food-growing gardens. The tower would be built gradually according to the needs of its residents, adding volumes for education, trade, culture, sports and other uses. 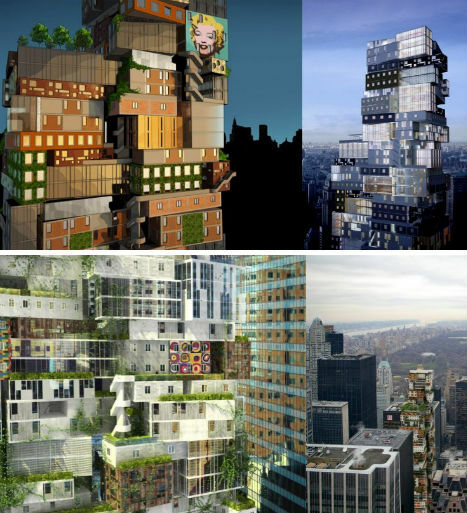 What if you scooped up all of the different forms of architecture that can be found on any given city block, and threw them together into one tower? It might look something like this: the Alternative Tower for MoMA at 53 West 53rd Street in Manhattan, by Axis Mundi Architecture. 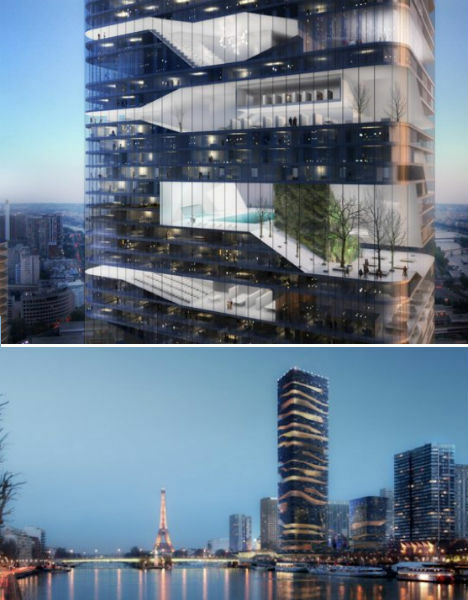 The tower is essentially a vertical neighborhood, envisioning the 73-story expansion of the Museum of Modern Art as a diverse community turned on its side. The outside is covered in references to the art treasures held within, like Andy Warhol’s infamous Marilyn Monroe portrait. 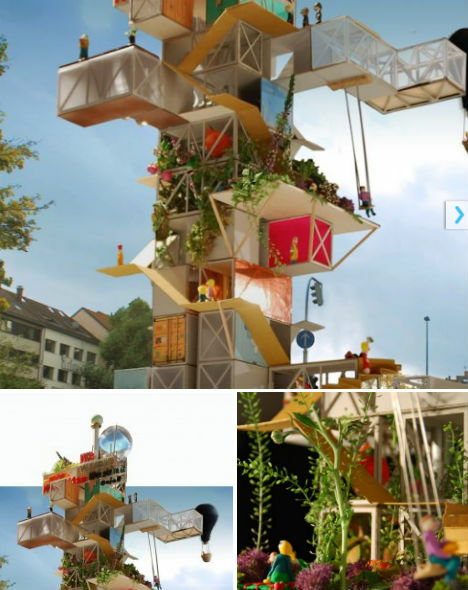 A Jenga-like configuration of solid and hollow volumes, the IABR Paralell Cases – Lotto Turm tower by architecture student Lars Behrendt is a playful idea for a lot in Stuttgart, Germany that is currently used for parking. Taking this prime land and giving it back to the people, the design consists of 55 stacked shipping containers that can be re-arranged as the needs of the community change. Open to the public, the building features a park, terraces, a capsule hotel and various types of entertainment. A stalled construction project could be used to generate clean, renewable energy in the EcoPods concept by Boston architects Howeler + Yoon and Los Angeles digital designers Squared Design Lab. 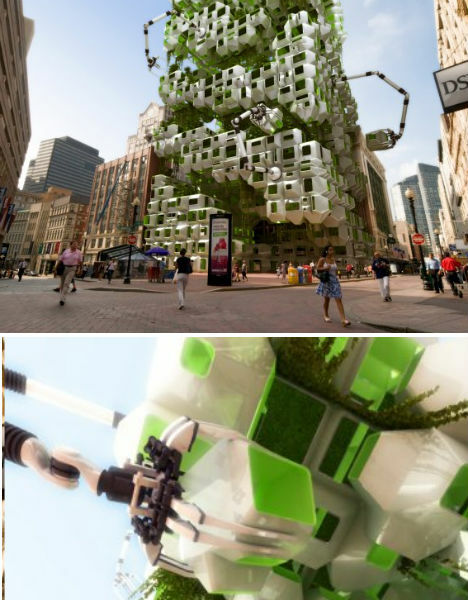 The unfinished building at Downtown Crossing could serve as a skeleton for a series of parasitic, modular pods that grow algae for biofuel. Robotic arms powered by that biofuel would constantly arrange and re-arrange the pods to ensure optimal growing conditions, and ideally the pods could be moved to a new site once the construction project is re-started. 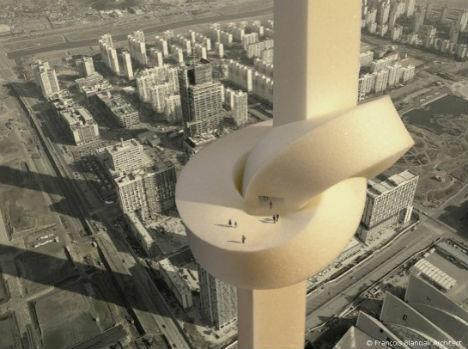 Built-in wind turbines take advantage of the height of this innovative tower design by Oppenheim Architecture. 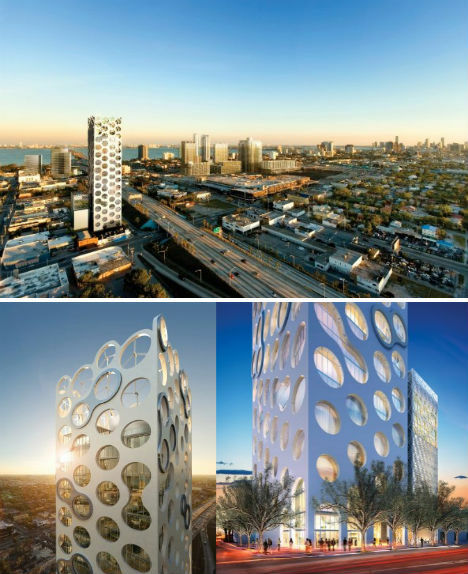 Located in Miami’s Design District, the COR tower is a sustainable mixed-use development that gets much of its power from wind energy and sola rpanels, and also features solar hot water generation. Large circular openings covering multiple floors throughout the facade give the tower a polka-dotted appearance. 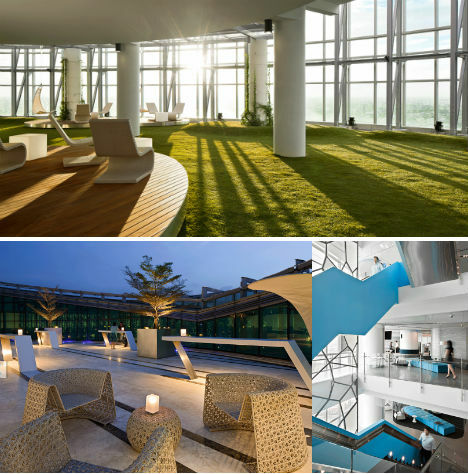 You might not associate carpets of lush green grass, fresh air and bright sunlight with petroleum exploration, but the employees of Bangkok’s PTTEP (national petroleum exploration company) certainly do now that they’re working in this stunning office space every day. This competition-winning design by Hassell features a number of large open-plan workspaces that place an emphasis on the enjoyment of nature. Surprisingly organic and yet fittingly monolithic for the setting, Zaha Hadid’s Stone Towers rise like an artificial forest in Egypt’s capital city of Cairo. 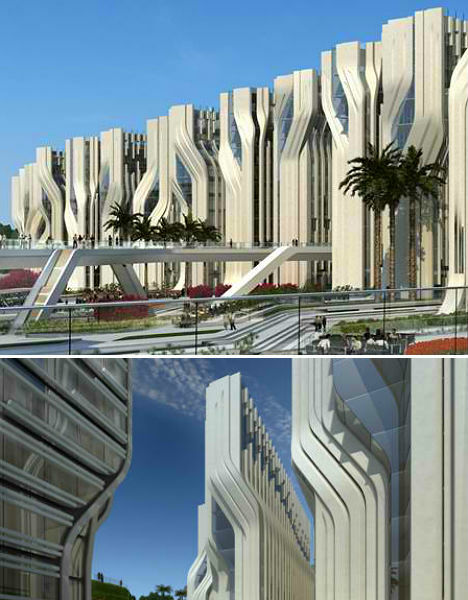 The towers, which bend and curve, were inspired by the patterns and textures of Egyptian stonework. Each curve was carefully designed to create patterns of sunlight and shade throughout the office complex. 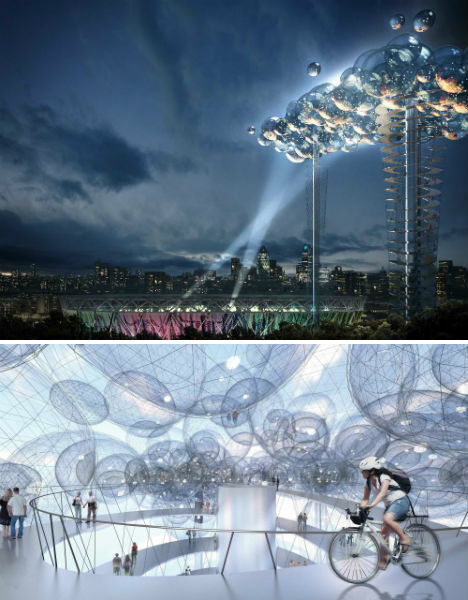 Designed for the London Olympics in 2012, ‘Cloud Over London’ is a concept for an energy-producing ‘cloud’ of inflatable, light-emitting spheres attached to towers with spiraling ramps that bring visitors to the top. The idea is that the bubbles will grow and reproduce based on crowd demand expressed through social media like Twitter and Facebook. Visitors can walk or bike to the top, and the energy produced by the way back down can be converted into electricity by elevators with regenerative braking. Inside the ‘cloud’ itself will be a variety of LED displays transmitting data like energy use, spectator numbers and decibel levels, which can be seen from all over London. 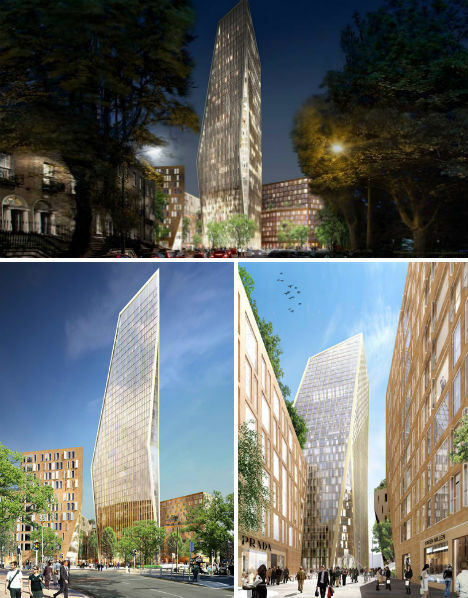 A super-skinny skyscraper resembling a blade was set to be built in Dublin, but was ultimately rejected for being “too intense.” Jury Berkeley Court was to be a 37-story skyscraper with leisure facilities, offices and over 500 apartments. Designed by Henning Larsen, the tower would certainly have been a departure from most of the architecture currently found in the city. In my experience, most construction engineers work with plans already designed. We may improvise once in a while, but more often than not, we use plans designed already, whether by architects, urban planners, or other technicians.